What’s up, Dr. Tony Wagner? I have been a long-time fan of Dr. Tony Wagner. His quote, “it is not what you know, but what you do with what you know” is one that I repeat regularly – to myself and to colleagues in order to switch our focus from collecting knowledge to connecting ideas and concepts, to creating and sharing with others. …as long as we insist on testing every student every year, instead of testing only a sample of students every few years, we will be unable to afford the kinds of assessments, like the College and Work Readiness Assessment, that measure the skills that matter most. …I believe that this “reform” will only serve to accelerate the trend of teaching to the tests and to ensure that whatever good qualities that may exist in the Common Core will be lost in an increasingly test-prep-centered curriculum. I continue to worry about the impact of a test-prep curriculum on student motivation, as well as on teacher morale. Dr. Wagner describes the current situation as one in which there is an “overzealous focus on standardized testing”. So, can you imagine my surprise when I open an email from NWEA (Northwest Evaluation Association) and find that at their Fusion Central conference in July, none other than Dr. Wagner is the keynote speaker. NWEA is the author of MAP tests (Measures of Academic Progress). 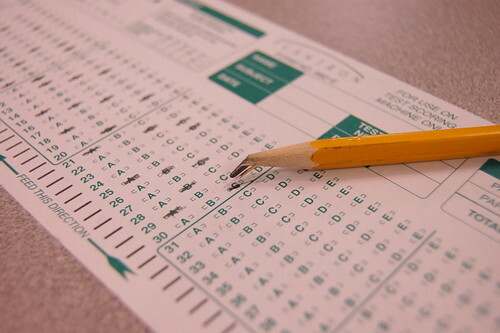 A standardized test. This seems like such a disconnect to me in light of everything I know about Dr. Wagner and his high regard for experiential learning and a holistic education. Has he sold out? Gone over to the dark side? I can’t believe that this is possible, so why is he there? To scale innovation, we need broader agreement on the education outcomes that matter most, as well as an accountability system aligned with those outcomes. The key to accomplishing these two tasks, I believe, is for educators to more actively engage with business and community leaders and to work together to develop a more 21st Century appropriate accountability system. My hope is that Dr. Wagner is seeking to become part of the solution. That he wants to have a hand in how the tests are created in order to help develop tests that are broader in scope and take into account things beyond the limitations of current standardized tests. Or, perhaps his goal is to show educators who are required by schools or districts to administer these tests how they can use the results of these tests to ‘create innovators’ and build upon student strengths. I would like to think that there is a way of making valuable something that takes so much of a student’s time and removes them from the classroom. And yet another part of me hopes that he will just stand up there and declare “NO MORE STANDARDIZED TESTING!” And the audience will go wild! Whichever way it plays out, I will definitely be following closely to see what comes of this. Next postSummer Slide – A reality or media construct? Hear! Hear! Either way, it seems some sort of action is in the offing!